Which is a trojen, trojen are generally found to remote access tools to steal information from other peoples computers. My computer does not contain any known virus as it is kept up to date with the latest windows updates and Antivirus updates. http://www.bsplayer.org/index.php?p=...60fcada35206b8 and was intercepted before it became available on my hard drive. I scanned mine n dont see anything. 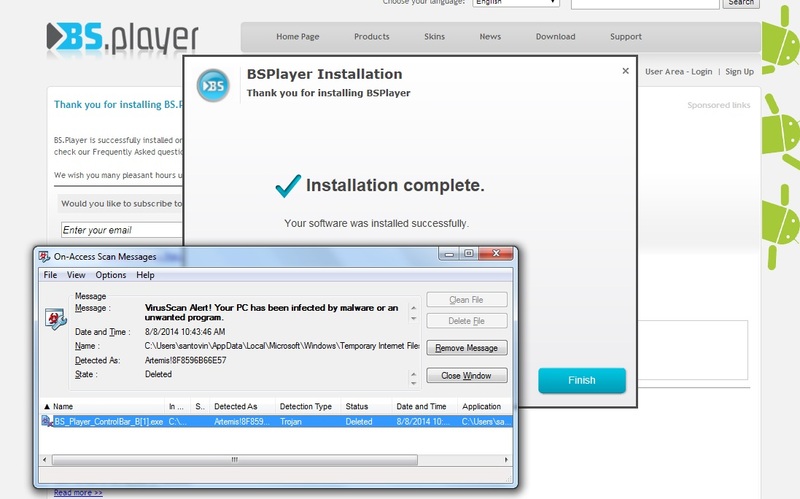 The bsplayer100.810.exe was downloaded with the Download-Button of bsplayer.org. A scan of the whole System received no further warnings, so i assume, system is safe. Is it a false alarm, due to reprogramming of the render-engine? It triggered alarm (false, I suspect) on old installers and existing uninstaller. ok I use sophos, the IDE for this virus was released today, so if it is a virus the protection from it is very new. Troj/Multidr-KE extracts and runs several files. Two of these are detected as Troj/Sysme-A and Troj/Dloader-BA. The others are adware related. When executed, the Trojan installs a registry entry to run itself on system startup and attempts to download a file from a specific webserver. Troj/Sysme-A may email information out from the infected computer. Troj/Dloader-BA is a downloader Trojan. When executed it will attempt to download and run a file from a webserver. Seems it was a false alarm after all. Seems they watched the match, then went back to business. I once encountered a similar problem with another software and Avast antivirus. It turned out the exe was clean and it was a false alarm. I reported it to Avast and they corrected the antivirus. One thing you can do is not to set your antivirus as resident and then download BSPlayer.